Today I'm drinking CRIS Chocolate Russian Imperial Stout brewed by Homebrew Brent at the Shvitzing Matilda Brewery in Lake Worth, Florida. No joking! Chocolate! Russian! Imperial! Stout! Brent was nice enough to share this with me last week when I finally met him at Beer Tasting Extravaganza 4. The homemade label featuring the Kremlin was also done by Brent and is very cool. Chocolate on top of chocolate aroma, sweet and delicious. There are also little whiffs of vanilla and a touch of alcohol there. Creamy smooth texture. Nice chocolate and cocoa flavors, almost milky. Licorice and vanilla are also in play, poking in and out. The 9.56% alcohol definitely brings out all the flavors, making each stand on its own. Medium body but extremely low carbonation. Great flavors could have used a carbonation pick-me-up, but next time you're in Lake Worth, you'll know where to go. Nice job, Brent! I'm going to drink yours now, keep your eyes open! I am so glad you liked it. I agree the carbonation was low. 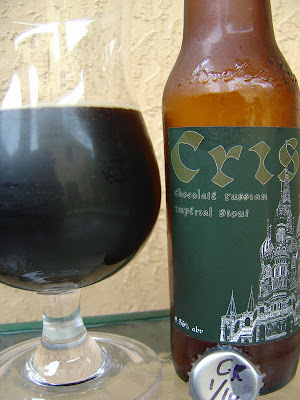 I was on the fence when brewing it between carbing it like a british stout (low) or like a Russian Imperial (medium). I settled on lower for 2 reasons, 1 I tend to over-carb and 2 I like my stout darn near flat. Nonetheless, your positive words have motivated me to submit this for competition, wish me luck! Brent. Thanks so much for letting me try your beer. Good luck in the competition. Can't wait to hear how it turns out.